The noughties were hardly the best time to return to study, acquire a BA, an MA an ECDL and then assume there might be the vaguest possibility of finding a job. Although it is supposed to be illegal to discriminate on the grounds of age, and there is no requirement to put your date of birth on your CV, any prospective employer could easily work out my age very roughly, just by reading through said CV. So, having given up on the idea of lucrative paid employment using the skills I believed I’d acquired as a secretary, a mother, a self-employed retailer, and finally my higher education qualifications, I decided to launch myself on the voluntary market. We’re told we’re all in the Big Society together and everybody remarked on how useful the extra skills and qualifications would look on my CV. 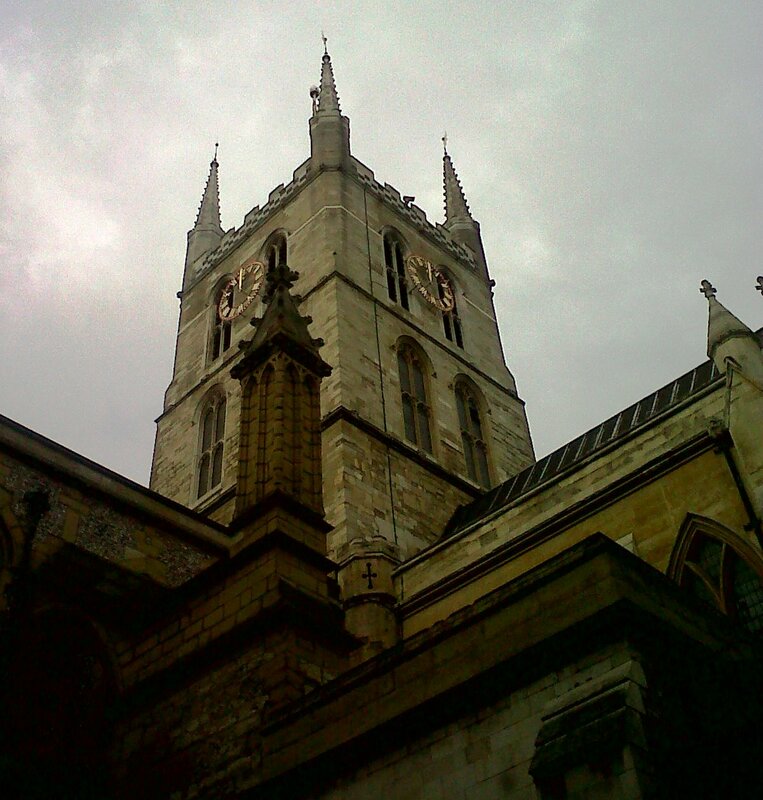 I started off helping out the Visitors’ Officer in Southwark Cathedral. I jumped at the possibility not only because the Cathedral is close to Shakespeare’s Globe Theatre, but also because my masters is in Shakespeare and the Cathedral was once the parish church of the early modern theatre players and writers. Returning to an office environment helped to re-build my confidence and reinforce my computing skills, but after a few months I was getting bored. There was no chance of the job offering any more of a challenge, and definitely no possibility of being paid for what I was doing, so after about six months at Southwark, we agreed to part company. However I had also acquired a couple of certificates in Health and Safety along the way. I then came across an advert for somebody to give Internet Taster Sessions at my local library. I’ve been going in on a regular weekly basis and usually spend three-hour long sessions showing older people how to use the internet, shop online, set up email accounts, and all the basics that so many of us take for granted. Another opportunity presented itself in the guise of the Sixtieth Birthday Anniversary Celebrations for the 1951 Festival of Britain. After filling in forms, attending for an interview, and then a training session, I was launched as a Team Leader on the South Bank. My passion for the arts prompted the initial application, although there was less involvement with inside the Royal Festival Hall, and the work was centred on the area along The Queen’s Walk, between the Royal Festival Hall and the river. As a Team Leader I was responsible for two shifts of volunteers, one of which clocked on at 11 am and worked until 4 pm, and the second group overlapped with them, starting at 1 pm and finishing around 6 pm. Intellectually the work wasn’t hard, although we were supposed to act as tourist information guides above and beyond our training. We all found ourselves learning on the job, finding out answers to questions we’d never considered, and then not ever being asked the same thing again. Anyway I’m now a mine of information and can advise you where the nearest cash point is when the one in the RFH is out-of-order, where to get accessories for your digital camera, where to find the nearest pharmacy, and how long it takes to walk from the South Bank to London’s Bankside. Oh, I nearly forgot, I even told somebody how to reach London’s Hard Rock Café from Waterloo. 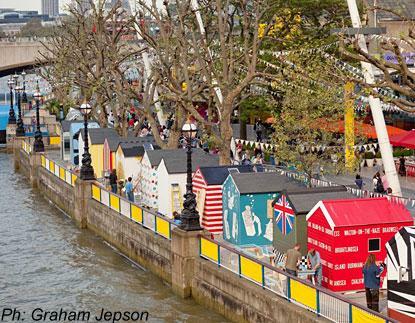 We generally walked around the entire area of the Festival, but spent most of our time by the Beach Huts, with their individual installations, along the Queen’s Walk beside the river. We had a lot of fun and made friends with each other, as well as enjoying chats with many of the visitors to the South Bank, especially the older people who remembered (often with a jolt) that they’d been at the original Festival and that sixty years had elapsed between the two events. 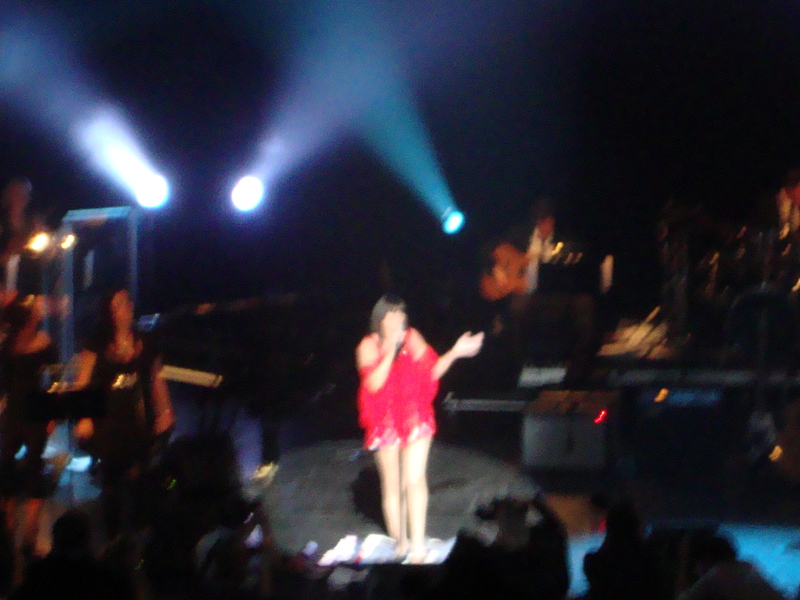 We were offered the occasional perks in the form of free tickets for South Bank events. I never did take up the offer of a free guided visit to the Tracy Emin exhibition, but spent an enjoyable day at the Vintage Festival, culminating with a concert starring 10CC and Sandie Shaw. We’ve all got old together, but I suppose some have aged better than others. Vintage was fab, especially the outfits worn by many of the attendees. There were some amazing forties and fifties costumes. I suppose a lot of women chose those decades because the clothes, hairstyles and makeup were much more glamorous and possibly feminine than nowadays. There were some really accomplished forties hairdos, accompanied by seamed stockings, and everything in between. The fifties look was also a popular one, with full skirts worn over stiff lace petticoats, and set off with back-combed and beehived hair. Some of the men also went the whole hog, including some of them in officers’ uniforms from WW2. We were very interested in what we thought were vintage, reconditioned juke boxes. The ultimate let down was that one was actually retro and even had a remote control and digital information. During the early part of the Festival there were many free lunchtime concerts in the RFH’s Clore Ballroom. One particular musical band had everybody dancing, from toddlers to seniors. The music was so infectious that it was difficult to stand still. When the weather was fine (which was not generally the case this summer) the South Bank took on a holiday atmosphere. It was almost like being at the seaside with the displays in the various beach huts along by the river, especially with the addition of the sandy beach that was imported from Southend-on-Sea. On sunny days it was a delight to watch many of the younger children playing on the beach. In these days of foreign travel, I don’t think many children actually know what it’s like to play on an English beach. 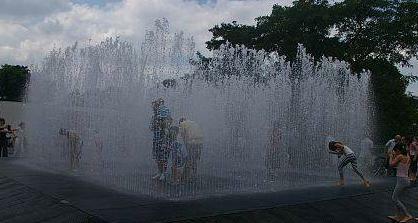 There is also the water fountain outside the Queen Elizabeth Hall. I’ve rarely seen children (and teenagers) enjoying themselves so much as they tried to cool off and dodge the ‘walls’ of water that sprang up and died down at random. We also had a lot of fun with the Photo Booth. People could come into the booth and pose for photos, singly or in groups. If they wanted they could also write something on the white boards provided and hold them up while they posed. A lot of people were sceptical at first and didn’t believe us when we told them that the service was entirely free; we only needed them to enter their email address on the keyboard below the screen and the photo would be emailed to them. We were very aware of the English reticence and reserve, but persuaded loads of tourists and Londoners to pose for their pictures. There were also the ‘Real Food Markets’ that took place every Friday, Saturday and Sunday. The smells were so inviting and some of the foods on offer were so delicious that you were pleased to come back again the following week and sample them again, or try something different. Sadly all good things come to an end. I worked Fridays, and the final Friday of the Festival was a glorious day. Summer reappeared (and we’d had some atrocious Fridays where we’d spent more time dodging the rain than doing anything else) and the South Bank once again took on a holiday atmosphere at the very end of the school holidays. I should have let sleeping dogs lie, but decided to go in for a final stint the following Monday, the closing day of the Festival. The weather changed again and my memories of a sunny South Bank were soon dispelled. However I got to keep my polo shirt and fleece proclaiming ‘Festival Information’. 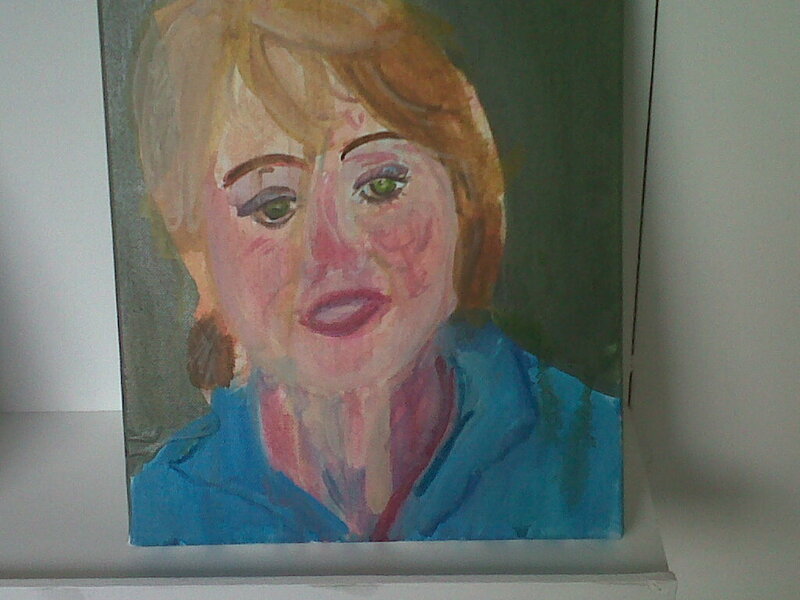 And I had my portrait painted by Lady Lucy.